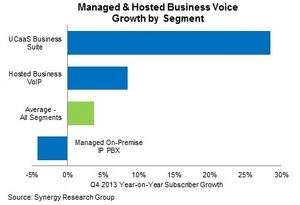 UCaaS Penetration of Managed & Hosted Business Voice Grows: but Where Are the Telcos? RENO, NV--(Marketwired - Mar 14, 2014) - New Q4 data from Synergy Research Group shows that UCaaS business suite now accounts for 8% of all managed and hosted business voice subscribers thanks to an annual growth rate of almost 30%. By comparison, managed on-premise IP PBX subscriber numbers are steadily declining while hosted business VoIP subscribers are growing, but at a rate of well below 10% per year. In Q4 the UCaaS business suite market leaders by revenue were 8x8, ShoreTel and RingCentral, who in aggregate accounted for 36% of the market. The market share by subscriber count ranking is different due to the substantially different ASPs in the public and private sub-segments. By subscribers, Fonality, Vocalocity and Mitel join the market leaders. In the hosted business VoIP and managed on-premise IP PBX segments there is no one clear market leader, with NTT, AT&T, Verizon, BT and Orange all having similar scale operations; following them are a long list of other traditional telcos. "A fascinating battle is playing out between traditional telcos on the one hand and much smaller specialist operators and technology vendors on the other," said Jeremy Duke, Synergy Research Group's founder and Chief Analyst. "Clearly UCaaS is going to carve out an ever-greater share of the managed and hosted business voice market and at the moment the telcos are being very slow to respond to the changing market." Synergy has provided in-depth coverage of the UCaaS market for well over a year, and has just released a market primer that is available to non-clients. The high-level market summary is free to service providers, IT vendors, telecom vendors and financial analysts at www.srgresearch.com. The primer features summary data taken from Synergy's Cloud UC and Managed & Hosted Business Voice services which provide quarterly revenue and subscriber data for UCaaS and related markets, plus associated forecasts. For all other questions, please contact Synergy at primer@srgresearch.com or at (775) 852-3330 extension 101. Synergy provides quarterly market tracking and segmentation data on IT and Cloud related markets, including vendor revenues by segment and by region. Market shares and forecasts are provided via Synergy's uniquely designed online database tool, which enables easy access to complex data sets. Synergy Research Group helps marketing and strategic decision makers around the world via its syndicated market research programs and custom consulting projects. For over a decade, Synergy has been a trusted source for quantitative research and market intelligence. Synergy is a strategic partner of TeleGeography. To speak to an analyst or to find out how to receive a copy of a Synergy report, please contact Heather Gallo @ hgallo@srgresearch.com or at 775-852-3330 extension 101.